The drool sat in Gnarax' beard like a fly caught in a web, mixing with the dried blood from his last meal. The back of his hand caught the prisoner across the chin sending a tooth spinning through the fetid air of the tent. He eyed the tooth, it's bloodied root bright red against the white of the leopard skin on the tent floor. "String him up. We attack at first light and they will all be dead before the sun sinks below Machaerus' lip". 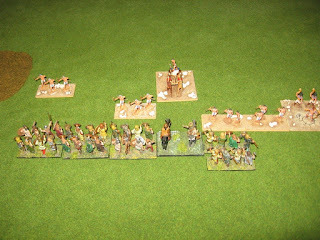 Andy I finally got together for another Big Battle HotT, his now complete semi historical Egyptian army against my barbarian army composed of distinctly Hunnic looking riders and knights supported by very barbarian looking spear. They were supported by Trolls and mammoths (behemoths), and Gnarax himself, the hero. Both sides were keen to get in to is, and the centres quickly clashed. 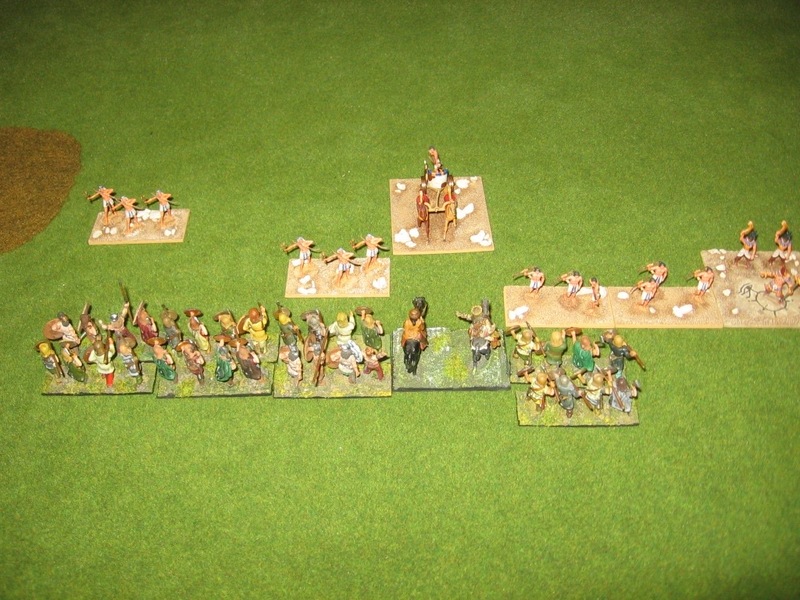 The Egyptian left was held by spear lead by a hero general in a chariot, and supported by behemoths. They faced a combination of knights, riders and behemoths. The barbarian left was similar. The barbarian hero tree God (taken as a hero) threw himself against the Egyptian magician.. gah.. ensorcelled. 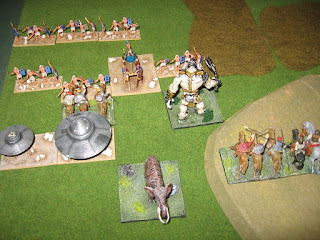 The Egyptian CnC (aerial hero) overflew the barbarian forces, landing behind ready to attack from the rear in support of his own blade. 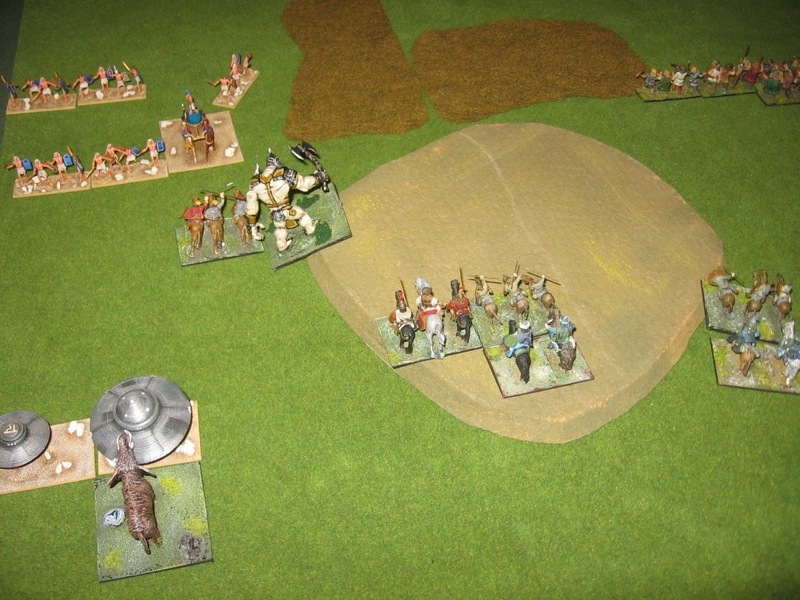 The Egyptian CnC goes into action, attacking a unit of knights in the rear. 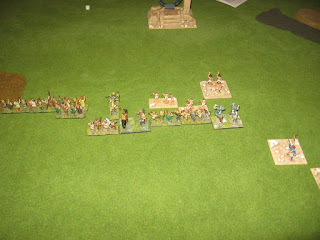 The Egyptian centre starts to crumble, with the general lost. However they manage to avoid demoralisation. 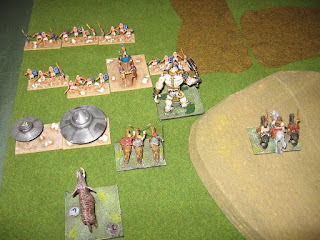 But then the barbarian right simply crumbles, with catastrophic losses. The command is demoralised. 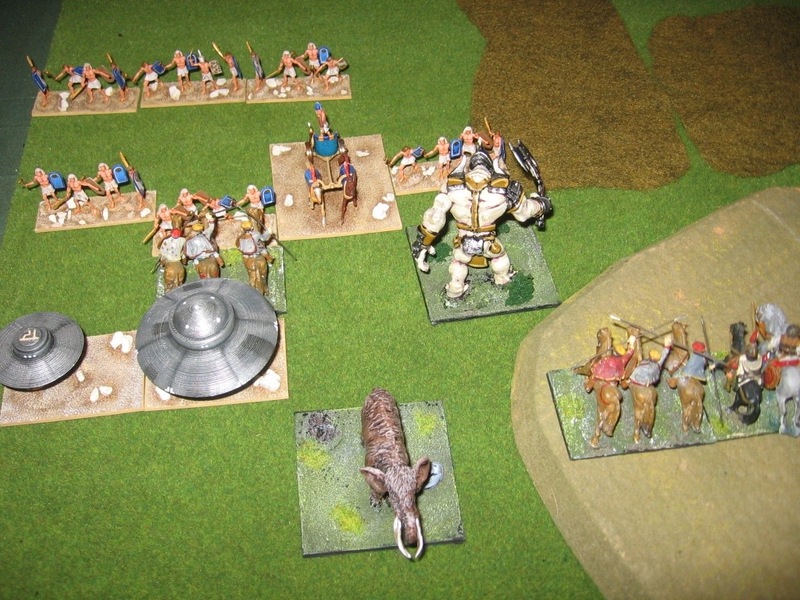 An epic clashes occurs when the Egyptian CnC attacks the mammoth behemoth. 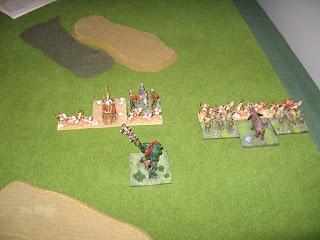 The Ch]nC wins, and a barbarian rider tries to hold up the flank. The Egyptian left, having defeated its barbarian opposition, now starts to move across to the centre to attack Gnarax himself. But the day was lost for Gnarax as his left wing also crumbled. His invasion of the Egyptian lands had been brought to a halt in an epic struggle. A fantastic Big Battle HotT game providing plenty of drama (as these games so often do) as the balance swung form one side to the other. 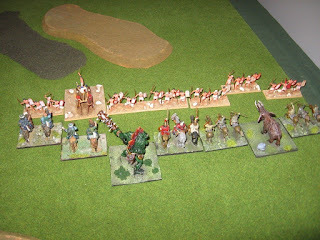 The game went to the Egyptians when the barbarians finally lost over 50% of their points in a flurry of sudden losses over the last two turns. "Bally bad show, sorry sir". "Yes yes quite so, Nicholas my boy", and the air whistled from his half blocked nostrils. "There we were toe to toe with that damned greenskin general in 'is chariot, and some mad maniac orc in the weirdest of flying machines bally well hits us from behind. Dashed poor show I thought. Poor form and all that. Just not British.". "Yes quite, my boy. Damned tricky chap the mad green skin maniac type. Odd sort to get a handle on. Know just how you feel. Got badly smacked around by one of those odd eastern types in some damned saucer flying machine meself the other month as you'll recall." "Ah yes, but you still managed to take the day eh wot Sir?" Caruthers gave a self satisfied smile at the acknowledgement of his own marshal prowess. "Yes yes. No matter. Those evil types seem to have gone quiet. No follow up after their victory. Rumour has it there's been a falling out between them. Not surprised of course. Old Johnny Green skin ain't likely to get along with anyone for very long eh wot" and the waxed tips of his moustache wiggled up and down with his smirk. He took another swig of his pink gin. "Best to get right back on the old horse eh Nicholas my boy? Seems to be a bit of pirate trouble down on the coast. I want you to take a small detachment and sort the blighters out." "Too right sir" came Nicholas' quick response. "Can't let three breaks in the old arm get in the way eh" and they both laughed and clinked their gin glasses together in toast. 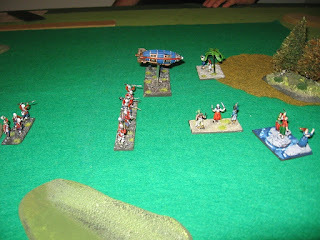 So Nick and I set down the makings of a standard 24 point HotT game with British VSF versus Pirates. 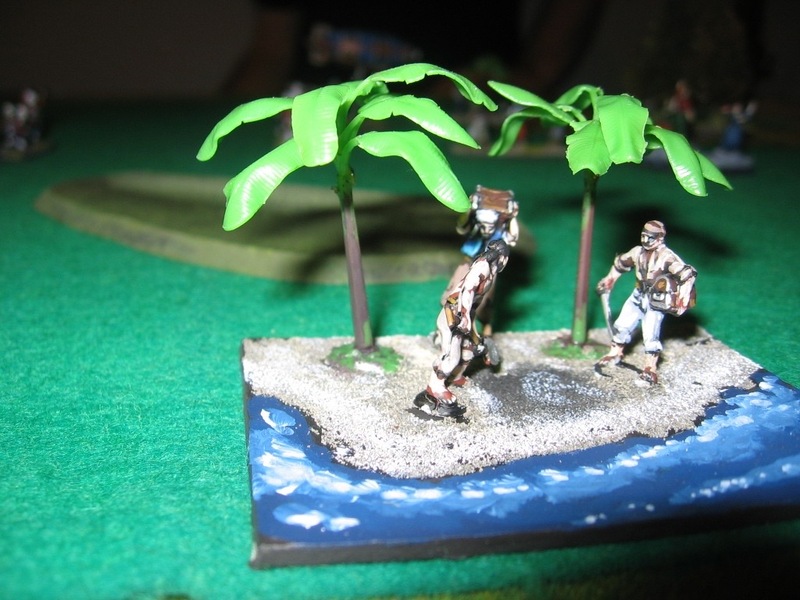 Pirate coves trying to bury their treasure in their camp before the cursed British types made landfall. The pirates lined up, with some drunken hordes making for the cover on their left, and their mystical airboat sailing off around their right. Brigadier Nicholas' command lined up ready to advance on the pirate camp, lancers in the centre. Then the lines hit, and the clash of stolen naval steel against bayonets is heard to ring out across the island. The airboat finds a fair wind finally and swoops in behind the British line. The lancers are pushed back onto the airboat and are eliminated. Young Lieutenant Winstanly, famed British hero and Johnny on the spot hits the airboat, supported by one of the British flyers. And the day goes to Brigadier Nicholas, his honour restored. The pirates manage to finished burying their treasure before fleeing the island shores, cursing and swearing that revenge will be theirs. This was one of those games that hung in the balance, able to go either way. 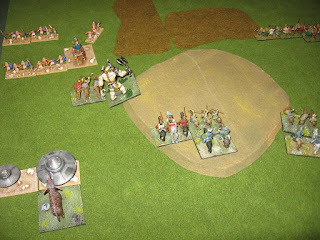 Nick's clever use of Winstanley his hero did the damage, eliminating the airboat in particular, allowing his blade to carve their way through the pirate warband. Brigadier Nicholas will take his thrice broken arm and make a grand report back to Caruthers about his great victory.